Deborah Jacobs quit the job from hell, rented her house and planned to Airbnb her way through France. This inspiring memoir chronicles her misadventures as she and her husband cook in quirky kitchens, struggle to speak French and shop like locals in outdoor markets. With candor and optimism, Jacobs transports readers from the grape harvest in the Loire Valley to an exuberant chile pepper festival in Basque Country and, ultimately, to Paris, where she witnesses history in the making. En route, she does the pintxo bar crawl in San Sebastián, Spain, develops an affinity for sheep's milk cheese and cultivates new friendships. 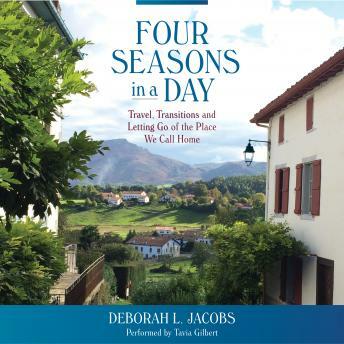 Four Seasons in a Day, an expression used to describe the changeable weather in the Pyrenees, also captures the author's extreme resilience. Her grit and determination in the face of every obstacle give us the courage to chart our own course, carve out a new life and embrace the unexpected. This audiobook is performed by Tavia Gilbiert, the 2017 Audie Awards winner for best female narrator.